"I think it's going to make a tremendous difference for children who have such anxieties and fears related to coming to court." ANNAPOLIS, Md. 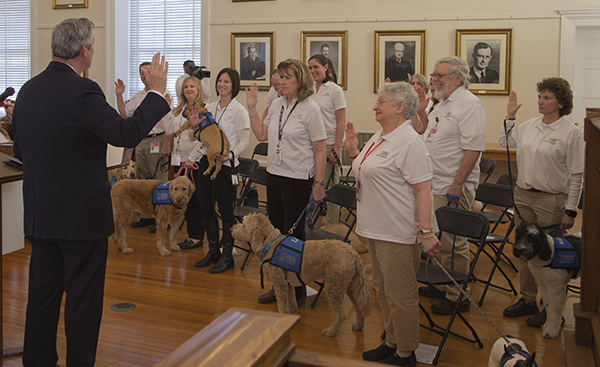 –The launch of a new pilot program in two Maryland courts was celebrated with applause and lots of tail wagging. 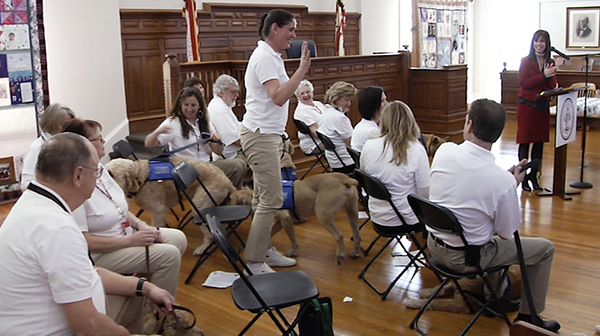 Dozens of people and several dogs gathered inside the Circuit Court for Anne Arundel County courthouse to witness the launch of the Anne Arundel County Circuit Court Dog Program. The pilot program is now fully operational and will allow facility and therapy dogs to enter the courthouse to accompany child witnesses who are testifying or appearing in criminal or civil cases. Teams of trained facility dogs and their handlers joined Maryland Court of Appeals Chief Judge Mary Ellen Barbera, Judge Laura Kiessling, administrative judge for the Fifth Judicial Circuit (Anne Arundel, Carroll, and Howard counties), State Court Administrator Pamela Harris, and State Sen. Bryan Simonaire, of District 31, for a ceremony on Feb. 8. The teams were sworn in and took a tour of the courthouse. "I'm excited for the requests to come in and to see the program come to fruition,” Judge Kiessling said. “I think it's going to make a tremendous difference for children who have such anxieties and fears related to coming to court." Simonaire spearheaded the idea behind the pilot program. 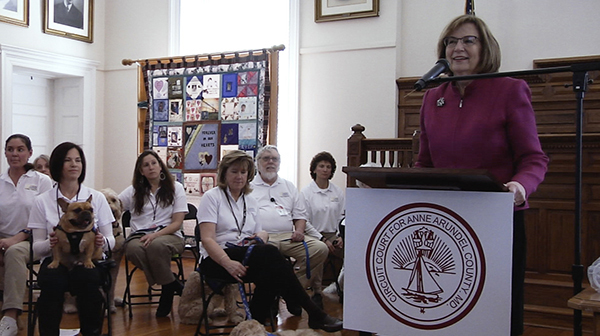 Anne Arundel County Circuit Court partnered with the Caring Canines Pet Therapy team to assist with the implementation. Caring Canines is a pet therapy program created by Dogwood Acres Pet Retreat in Davidsonville. According to organizers, the group provides certified pet therapy teams to those in the community in an effort to create a peaceful presence. Judge Kiessling said a program like this can have a huge impact because court testimony can be overwhelming for a child. Specific eligible witnesses will be identified by the state attorney's office, best interest attorney, or a volunteer Court Appointed Special Advocate (CASA). “They walk into a courtroom that is made for adults, they walk into a room full of strangers, they sit in a chair where their feet usually don't even reach the ground, they talk into a microphone and they're expected to tell the room full of strangers the most intimate details of something terrible that happened in their lives,” she said. “It's hard enough for adults and it's even more difficult for children." According to the court administrator for Anne Arundel County Circuit Court, a request must be made in writing or through an online submission form at least 30 days prior to all court proceedings. The administrative judge then reviews and approves or denies the request. The court dog pilot program is also operational in Harford County Circuit Court. For more information on how to make a request for a dog to accompany a child witness in Harford County Circuit Court, contact the court at 410-638-3426.